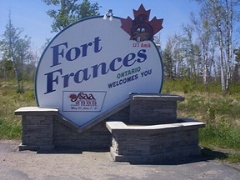 With a population of around 8000, Fort Frances is the largest town on Highway 11 west of Thunder Bay. Fort Frances is on the border with Minnesota, which you can cross to via the International Bridge. Fort Frances got its start as a fur trading crossroads. No less than four independent fur trading companies set up shop where Rainy River meets the lake of the same name. The Northwest Company, Fort St-Pierre (a French fur trading station,) the American Fur Company, and later an HBC outpost named after the wife of its governor were all present in the area. The modern town was founded in 1903 around the local paper mill and its power generating station. The last I heard, the mill was facing a crisis with a shut-down potentially on the horizon for its 700 employees. I don’t know what they’ll do with the hydro station if the mill shuts down – it’ll probably be kept online to generate power regardless. You can take a tour of the mill if you call ahead.Like every good town on Ontario’s Highway 11, Fort Frances has a few big, weird, random things in town. One is the Mermaid Statue on Copenhagen Island just off in Rainy Lake, apparently made by some Hans Christian Andersen fan. And there’s also a really big chair in one of their parks. I’m not sure if they have a competition with fellow big chair enthusiast Highway 11 towns Gravenhurst and Callander. Fort Frances’ mermaid is more Hans Christian Andersen than Walt Disney. And if probably a lot more comfortable on that rock than she be in Fort Frances’ big chair. In terms of tourist stuff, For Frances has a museum which recently celebrated the town’s centennial. There are the requisite lodges and wilderness outfitters found in northwest Ontario. Fort Frances has a nice waterfront and hosts the annual Fun in the Sun festival on Canada Day, with children’s activities, food, fish and chips, bathtub races, and more (according to the municipal website.) There is also a two week long festival of the arts hosted by the town in April. 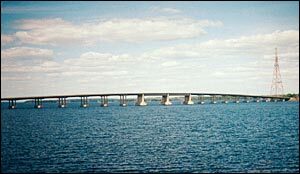 Just seven kilometres east of Fort Frances you can travel the Noden Causeway, which goes from island to island with nice views. There is also the Kitchen Creek Golf Club just outside of town. Other interesting things about Fort Frances include that more than one quarter of the population is Ukrainian, that it was hit by a Tornado in 1945, and that it hosts the annual Canadian Bass Fishing Championship. 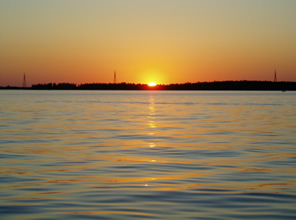 Sunset on the River near Fort Frances, with the bridge crossing to Minnesota in the photo above this one. This entry was posted in The Northwest and tagged amenities, big weird things, border crossing, hydro, pulp and paper by Highway11.ca Editor. Bookmark the permalink. It’s amazing…I had never thought about Highway 11 much until I moved to Toronto and got to know Yonge Street (Highway 11). We studied so much of Canada and North American History and geography in high school, but not much on local history – Fort Frances’ main drag is Scott Street, which really should be Yonge Street – and someday I plan to hike or bike the entire thing from Rainy River to my apartment near Yonge and Dundas in Toronto. I was born in Fort Frances of a Ukrainian Canadian mother and an American Irish mix father. As a child, I swam in Rainy Lake on both sides of the border: The City Beach in International Falls, and, The Point in Fort Frances. Summers I’d go on the train from the Fort to Atikokan, then go by boat to Crilly to stay with my aunt and uncle. I’m looking for Ukrainian names from about 1917 to the 1950′s. My mother had so many stories. Now I’m trying to remember names to go with these. I’ve also visited Toronto with my husband and we spent many happy hours on Yonge Street. I live in International Falls. I had no idea that there were other Grimoldby’s that lived in the area. I never knew my father. But I do have his last name. I know that his family is from Owen Sound Ont. I recall driving with my father, a history buff from Europe, through the outskirts of Fort Frances. I believe it was on the west side of toen, right on Hwy 11. My father was counting the trees that were planted there at that time alon the highway. (Silver Maples ? )When he was done counting he requested one minute of silence in the car…. Turned out that each of those trees was planted in commemoration of a Canadian soldier from The Fort, who had given his life, while liberating Europe in the nineteen forties…. My father bought a fur coat for his mother over 40 years ago and I have it the lable says it was from the Silver fur shoppe there would you know anything about how I can find out about it?